Green beans, also called snap beans or string beans, are usually harvested when the pods are still tender for fresh use. Green beans can also be harvested once the seeds inside have fully formed and used as a dry bean in recipes or you can save these seeds to replant in the garden the following year. Harvesting and drying the seeds correctly ensures they aren't damaged and don't rot during winter storage. Leave a few pods on the plant after your last harvest of the edible green bean pods so you can harvest for seed later in the summer. 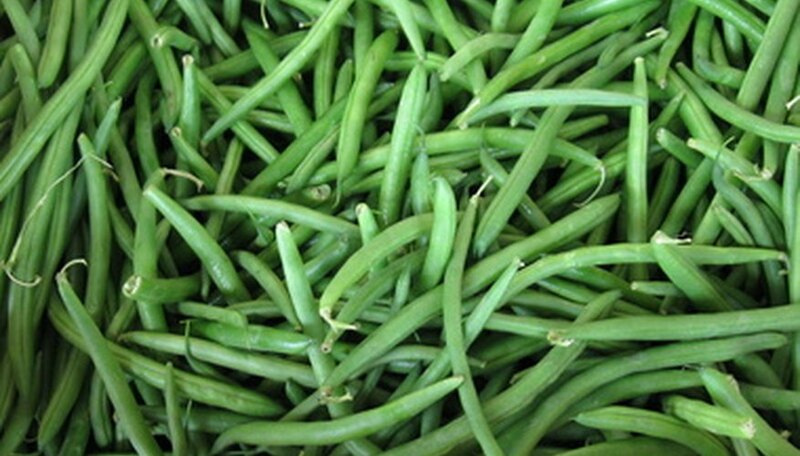 Leave the green bean pods on the plant until approximately one month after you harvested green beans for fresh eating. Wait until the pods turn brown and the seeds rattle inside. Mature seeds are larger and cause the pod to swell, unlike the flat pods that are used fresh. Pick the dried green bean pods from the bean bush or vine. Spread them out on a sheet of newspaper in a warm, dry room so that none of them are touching each other. Allow them to dry for two weeks. Split open the dried pods and remove the bean seeds. Place the shelled beans in a bowl then pick through them and remove any dried pod material that is mixed in with them. Store the bean seeds in a tightly sealed jar or bag. Keep the bag in in a dry, 32 to 41 degree F room until you are ready to cook them or replant the seeds. Label stored green beans with the particular bean variety and the year harvested. Most bean seeds remain viable and edible for at least two years. Cook dried green beans the same way you would cook other dry shelling beans. Moisture causes the seeds to rot. Always store in a dry place such as a pantry or the refrigerator.